FA: Paul Davidson, Kim Spence, late '70s. ACCESS NOTE: Please note that the forest service has restricted climbing for any routes past the area of Red Wagon (just left of the Trinity Cracks) due to tourist safety. Local access groups are working to get this restriction lifted. A short route with a short crux, but good moves on good stone. If it were 100' tall, it could have been classic... but it isn't. This climb goes up a boulder to a horizontal, then up an obtuse corner with a finger-to hand crack for a few 5.9 moves before topping out on lower angle broken rock. 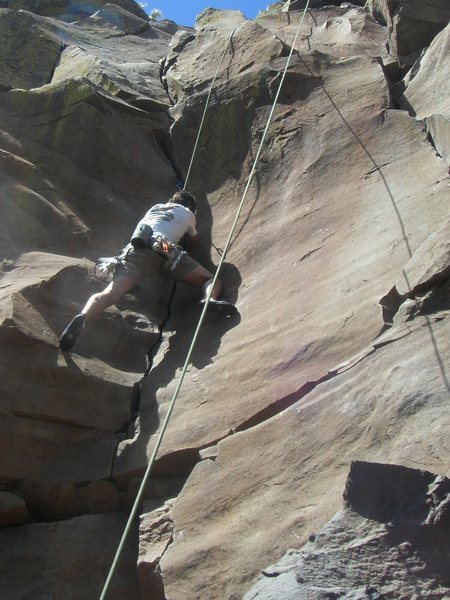 The crux is getting fully established in the crack after the horizontal and protects overhead. This is the second route encountered on the main wall of the overlook, heading back from the descent to the railings. A few nuts and 1 set of cams to 3"
Building an anchor up top is a little problematic and requires solid judgement. Bush Rush- short but sweet. High-stepping out of the crux. It's possible this was done earlier by Baxter/Dexter/Karlstrom but it was probably too short for them to have even looked at, had a bush in it and when we did it there was nothing in the original Alpineer guide that described it. Don't suppose anyone has a clue where that piece of history got off to ? Larry, do you have it ? Name came from the bush that used to grow out of the crux area and that Sr. Spence fought with on the first. I let him thrash with it, get most of the gear then in my typical fashion snaked his lead. The bush grew there for many years, but there's no trace of it now that I could see just walking by it. This is a climb that has spanked a lot of first time visitors. It's the first real obvious thing you come to and in today's sport world, size no longer matters, so a lot of folks jump on it. It looks pretty easy but as I recall, it's a bit of an off hand/finger size that requires some pure jamming for a couple of moves. So if you're versed in cracks, no problem, if you haven't done many then this one might feel pretty stiff for the grade. FWIW - many of our belays at the Overlook involved running the rope many feet back to a solid pine and tying it off, coming back out to the edge and then getting some directionals in. If you think this short crack is a 9- then you have skinny fingers. I hit a spot below the crux the only hold for my left hand was my two fingers on my right hand.